Allen Street Hardware Bar | Custom Laser Inc. Occupying an unused space “alley” between the wood exterior of one building and the brick exterior of another, the Allen Street Hardware back bar serves as the transition space between the main bar space and a multi-use communal space. The design of the base of the bar combines cherry boards separated by a clear coated natural steel and cherry fins system which serves as the primary structure. The bar top consists of sealed artificially rusted steel plates adjacent to a cherry bar rail. The wall behind is composed of staggered cherry boards into which is cut a series of holes to house a collection of wine. 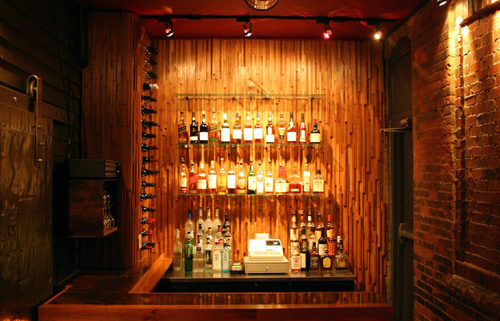 An industrial door, original to the brick walled building, has been resurfaced and placed on the facing wall and used as the door separating the main and back bar spaces.